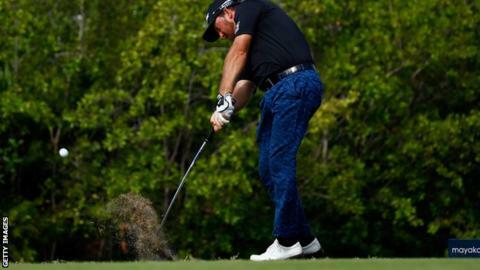 Northern Irishman Graeme McDowell carded a 63 to take a one-stroke lead at the halfway stage of the PGA Tour's OHL Classic in Mayakoba, Mexico. The 36-year-old former US Open champion has fallen to 85th in the world rankings after only one top-10 finish in 25 events this year. But he had nine birdies to reach 12 under, one ahead of Derek Fathauer. Scot Russell Knox, who sealed his first Tour win in Shanghai last week, had six birdies in a 65 and is five shots back. It is an impressive recovery from McDowell, who made a double bogey at the first hole on Thursday after sending his opening tee shot out of bounds and was within a fraction of doing the same with his next attempt. "I hit my second ball further right than I hit my first - I figured I could be going home very, very soon. Thankfully, my second ball kicked in-bounds," said the Ryder Cup player, who also bogeyed the first hole in his second round, which he began from the 10th. McDowell birdied four successive holes at the El Camaleon Golf Club after making his solitary bogey of the day. "I drove the ball much, much better today than yesterday and putted just as good, really seeing these greens well, putting decisively and making a few," he said. "It's been a frustrating year but that's the game of golf we know and love and you've got to take the rough with the smooth and keep trying." Justin Leonard, the 1997 Open champion, shares fifth after mixing six birdies with three bogeys in a 68, but Englishman Greg Owen's 70 left him at one under, which was one too many for the halfway cut.